June Bank Holiday Weekend 2015… Going for a swim? After years offering a reliable Courier and Parcel Delivery service in Dublin and Ireland you could argue we love rain… Truth is we don’t! 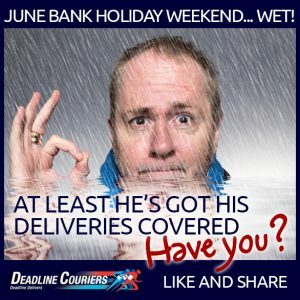 But we do take our job very seriously, and we know when you entrust us with your parcels and deliveries it is not a matter of thinking about the rain. We simply put on a “smile” and get on with it, it is our job and we do it well. If like us, you are the kind who get on with it and won’t let a bit of rain spoil your well earned bank holiday break, here are a few tips on what to do this weekend. All details taken from www.independent.ie, click the links for more details. Get into ship shape in Cork! Book a break in Borris! Wishing you all a Happy Bank Holiday Weekend… and don’t mind the rain! By Webmaster|2015-10-15T20:54:29+00:00May 29th, 2015|General, Social|Comments Off on June Bank Holiday Weekend 2015… Going for a swim?